The AGM-154A Joint Stand-Off Weapon (JSOW) is a modular precision-attack glide bomb. Intended to provide a low cost, highly lethal glide weapon with a standoff capability for the U.S. Air Force and Navy. JSOW will be used against a variety of land and sea targets and will operate from ranges outside enemy point defenses. JSOW’s modular design allows several different submunitions, unitary warheads, or non-lethal payloads to be carried.. JSOW program was initiated in 1986. Development goal was a pure fire-and-forget weapon without any post-launch target designation, like a laser designator or a command data link. In 1992, Texas Instruments (now Raytheon) won the development contract for the JSOW. The JSOW uses flip-out wings and four cruciform (plus two small horizontal) tailfins for flight control. It is guided by GPS/INS, with a better than 10ft CEP (Circular Error Probable). The AGM-154A warhead consists of 145 BLU-97/B submunitions. Each bomblet is designed for multi-target in one payload. The bomblets have a shaped charge for armor defeat capability, a fragmenting case for material destruction, and a zirconium ring for incendiary effects. Testing began in 1995 at Naval Air Weapon Center, China Lake, CA. In March 1996, the Air Force began testing the JSOW on the F-16 at Eglin AFB, Fl. The AGM-154A was finally certified as ready for operational use in December 1998. The USS Carl Vinson’s air wing first employed the JSOW during combat over southern Iraq on January 25, 1999. 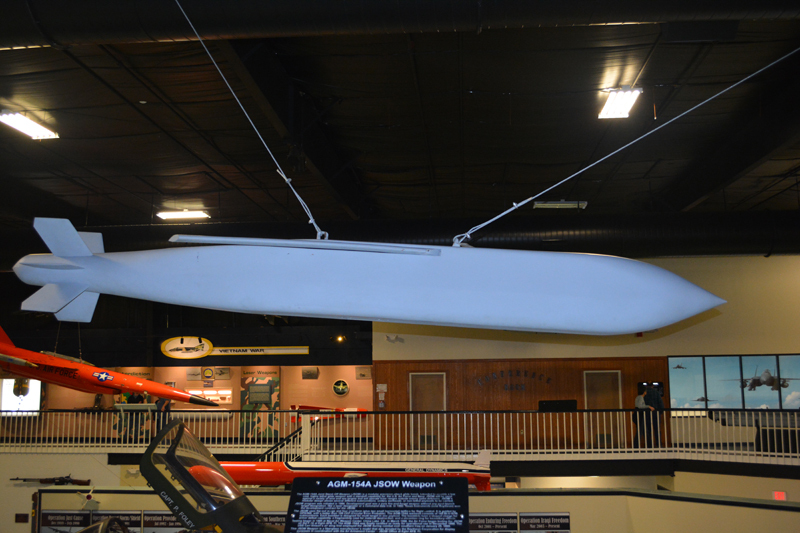 This JSOW Weapon is a fiberglass manufacturer’s model that was donated by the Raytheon Corporation for display purposes in coordination with the Air Armament Center – JSOW Office at Eglin AFB, FL.